Stop by and checkout the Garrett County Fair!! Thanks to cooperative (and generally sunny) weather, as well as the efforts of the event’s organizers, participants, and vendors, the Garrett County Agriculture Fair continues to offer an array of exhibits, food, rides, and games for patrons of all ages. Above is young fairgoer Jackson Doyle of Salisbury, Pa., who, undeterred by hands already full, scans a kiddie-pool sized sea of rubber ducklings in hope of choosing a winner. The fair continues through Saturday, Aug. 20, at the fairgrounds in McHenry. Photo by Barb Law. In addition to the rides and games of the midway, the 55th annual Garrett County Agriculture Fair will offer a wide range of fun activities for the whole family. Exhibits, musical entertainment, art displays, a magic show, and a wide variety of food and beverages are just some of the offerings that the $10 flat entrance fee will purchase. The event will take place from Aug. 13 to 20 at the fairgrounds in McHenry. For a complete schedule one may visit the web site www.garrettcountyfair.org. The Garrett County Roads Department has been busy working on the parking lot area at the fairgrounds in McHenry, general roads superintendent Jay Moyer indicated during a departmental update report for the county commissioners on Tuesday. He also reviewed paving projects and discussed adoption of an entrance permit policy with the officials. A five-acre area was excavated for the lot, with about 18 inches of top soil removed. A local contractor then donated 12,000 cubic yards of suitable sub-base material and approximately 2,000 cubic yards of Grizzly base stone was laid over the area. About 2,000 cubic yards of CR6 stone will be spread over the parking lot prior to the 55th annual Garrett County Agriculture Fair, scheduled for Saturday, Aug. 13, through Saturday, Aug. 20. In addition, 27 bases were installed for future lighting and five storm water collection inlets were constructed. “There’s definitely a lot of work yet to be done,” Moyer noted. 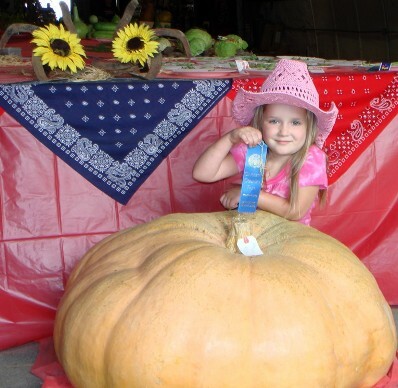 A blue ribbon is happily displayed by Tailynn Friend, who earned the award at last week’s Garrett County Agriculture Fair for her impressive “squash-like fruit,” as the pumpkin is described on Wikipedia. The pumpkin weighed no fewer than 289 pounds. Tailynn is one of hundreds of winning youngsters from last week’s event, the results of which will be reported in The Republican newspaper’s special Garrett County Fair supplement, to be published next week. The special pages will include the livestock sale report, multiple photographs, and lists of winners. Now if someone will simply carve out Tailynn’s pumpkin and attach it to a miniature pony, she will have transportation to her next ball. Photo by Danielle Friend. If you were at the Garrett County Agricultural Fair yesterday, you know first-hand how hot & muggy it was! I volunteered to work the Railey Realty booth in one of the exhibit barns. Very little heat escapes those barns, but it was well worth being there. Our best handout seemed to be the frisbees 🙂 I got to see a lot of friends & families exploring, though the attendance overall was low at the fair – I think the looming storm clouds made people think twice about coming. For the record, it didn’t rain at all until I was on my way home at 9:02pm and even then, it sprinkled. It was 86 degrees at 6pm last night – which is much warmer than a typical night at the fair. I got to partake in my favorite fair cuisine – a Lions club chicken dinner. Once again, they delivered the goods with a perfectly moist and impeccably seasoned chicken. If the weather holds out, we’ll be attending again this evening with the kids in tow. I still need to have some Rotary fries and a Farm Bureau milkshake 🙂 If you weren’t already aware, tickets at the gate are $10/each. BUT, Slopeside Exxon is selling books of 6 tickets for $30 – definitely a $$$ saver. Something I really enjoy is looking at the photographs that are entered – there are great pics and I uploaded a video to Facebook (of course, the I Love Garrett County & Deep Creek Group page) of all the photos – quality stuff! I got to talk to Donnie Storch from Bills Marine Service and he almost had me talked into a dune buggy looking Razr (?) for off-roading, etc….that’s all I need. Best part – it’ll go 70 mph. I also spent a lot of time talking to my neighbors in the exhibit barn – Paula & Tim Thomas, who is running for county commissioner. Very friendly folks who seemed to know EVERYBODY. We have several friends who entered goats & livestock – I’m personally looking forward to seeing Noah interact with all of the farm animals tonight 🙂 He’ll be 3 years old in a week and I think he’ll get to ride some rides this year, too! Go to the fair! Here is a link to the schedule. Work continues to progress on the new 30,000-square foot trade and exhibit hall at the Garrett County fairgrounds, with completion anticipated later this fall. According to the Garrett County Fair Board, the construction work will require that a number of changes be made during the fair, which runs from Saturday, Aug. 7, through Saturday, Aug. 14. Although the walk-in gate on U.S. Rt. 219 will remain open, all vehicle traffic must enter the grounds via the upper gate on Mosser Road. Handicapped parking areas have been designated near the Rt. 219 walk-in gate, the walk-in gate at the track, and the walk-in gate off the Mosser Road exit. Bleachers in front of the previous stage area have been removed as part of the construction project. The stage area itself will host small events and activities such as the pet show and senior citizens’ day activities. Now that spring-like weather is finally here, work can continue on the 30,000-square-foot Trade Center/Exhibit Hall at the Garrett County Fairgrounds in McHenry. A ground-breaking ceremony was held in September, signaling the formal start of the construction. Following a lengthy planning and bid process, Callas Construction of Hagerstown was awarded the contract valued at $2.9 million. The building is designed to accommodate a wide range of events, including commercial exhibits, entertainment acts, school and civic related functions, weddings, fundraisers, auctions, and more. The building includes office space and a commercial kitchen in addition to a platform for performing groups. The facility is projected to accommodate seating for 4,000+ people. Shelley Missimer of Lakeside Architecture Inc. is serving as the principal designer for the project.